Synopsis: Three old school gangster deliberately get sent to prison to organise the escape of an old friend whose wife is dying. Richie Archer and his geriatric cronies amble gently back for an opportunistic sequel which looks to cash in on its moderately successful predecessor, but sadly co-writer (with Simon Cluett) and director Sacha Bennett make no attempt to add any flesh to its cardboard cut-out characters. The title’s reference to stealing applies only to a fraction of the storyline, but presumably Bennett felt that We Still Break Old Lags Out of Prison the Old Way was too much of a mouthful. We Still Kill the Old Way saw retired London gangster Archer (Ian Ogilvy – Witchfinder General) returning from retirement in Spain to seek revenge on the street gang that killed his brother, but this time Bennett tries to turn him into a modern-day Robin Hood intent on forcing a crooked banker to donate his ill-gotten gains to charity. When the banker refuses, Archer, Roy (Christopher Ellison – Bonded by Blood) and Butch (Tony Denham – In the Name of the Father, The Guvnors) raid his vaults but are caught red-handed and thrown into prison. Don’t worry though, because it turns out the wily old foxes allowed themselves to be caught red-handed so that they would be banged up in the same prison as old lag George Briggs (Patrick Bergin – The Wee Man) who they intend to break out for a reunion with his wife before she finally succumbs to Alzheimer’s. Quite how they knew they would all be assigned to the same prison is never explain, but is typical of the lazy writing throughout. Once inside, Archer finds his plans disrupted by old nemesis Vic Farrow (Billy Murray – Strippers vs Werewolves, The Rise & Fall of a White Collar Hooligan) who arranges to be transferred to the same prison so that he can have his revenge for a betrayal dating back thirty or more years. 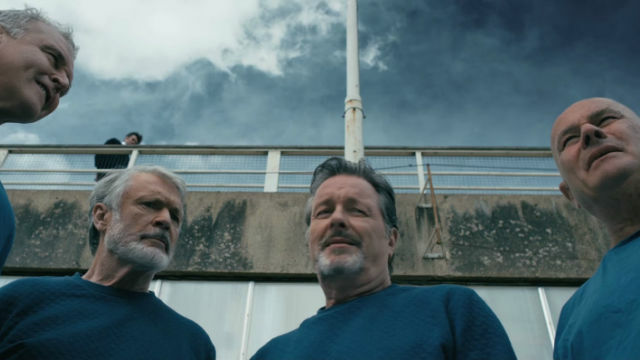 While there was a certainly novelty value in We Still Kill the Old Way’s idea of a bunch of ageing old-timers polishing their vintage knuckledusters to mix it with Britain’s new brand of near-feral street gangs, this sequel mostly pitches gangsters of pensionable age against one another, and one has to wonder who the target audience is supposed to be. Young men are hardly likely to be interested in a bunch of old farts issuing threats against one another for 90 minutes, while more mature audiences will see We Still Steal the Old Way as nothing more than the empty-headed DTV fodder that it undoubtedly is.